I Will Come Back for You is one of the books that came out recently and was so highly recommended by reviewers. 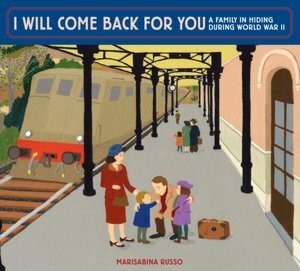 It is a fictionalized story about Marisabina Russo’s real life Jewish family living in Italy during the Second World War. The experience of Jews at that time and place is not the subject of many children’s books and so this is a welcome addition to the Holocaust body of work. Everyday Nonna (Grandmother) changes her jewelry with the exception of her charm bracelet. Like most charm bracelets, each charm represents one important aspect of Nonna’s life. The bracelet and the charms had been a gift from her daughter and prove to be an interesting way to talk about what happened to Nonna’s family during the war. One day, while looking at the charms, her granddaughter expresses an interest in hearing the story behind each one – a donkey, a piano, a bicycle, a piglet, a barn, a spinning wheel and a ship – that hang on it. Charm by charm Nonna’s story unfolds beginning with what life was life for her affluent Jewish family in Rome. These were happy, busy times for the children. But one day things changed and anti-Jewish laws were passed, just as they had been in Germany. Jews were no longer allowed to do the things they used to do or to go to places they had always enjoyed visiting after Italy aligned herself with Nazi Germany. Under these laws, Nonna’s papa was ordered to an internment camp, because he was a foreign born Jew. But the family could visit every weekend, staying with a kind family in the village. As Nonna continues her story, charm by charm, she tells her granddaughter of the sad events surrounding her papa and how the family had to go into hiding themselves, and how, with the help of some very kind people they stayed safe until they were able to immigrate to the United States after the war ended. This is a wonderful book for introducing young readers to one aspect of the Holocaust without being terribly frightening. It is told in simple, straightforward language enhanced by simple but effective illustrations. No illustrator is listed; however, the rather flat folk art type illustrations are done in watercolors. Russo has also included photographs of her own family in the endpapers from the 1930s and 1940s, and, in an afterward, she briefly tells the real story of her family, giving the fictionalized version of events its base in reality. There is also a glossary for both Italian and English words to help understand some of the words and concepts used. Sounds like an amazing book. I cannot imagine leaving my kids but I'm sure I'd be able to make this type of difficult choice when push comes to shove. Love the illustrations. Odd that they aren't acknowledged. Glad to know about this book. Thanks! I love the idea of using the charm bracelet as a way to introduce different aspects of Nonna's life. I always find something new(to me) when I visit your very interesting blog, thank you. Thank you for your kind words, Alex. This one is another wonderful review! By the way, have you read Across Five Aprils by Irene Hunt? It is about a boy left to care for the family farm during the Civil War. I found an old copy at a local bookstore and I immediately thought of you and your blog. That looks amazing, I love the illustrations in the trailer too. I always wonder about introducing these kinds of books to my kids, I mean, I'll probably cry at it. I guess I'm just lucky I have the choice and they don't have to live it. I will have to look at this one. Our eighth grade has a unit on the Holocaust, and sometimes picture books are easier to use for classroom reading. Russo is listed as the illustrator on the publisher's web site-- I think she may have done the cover for her House of Sports.